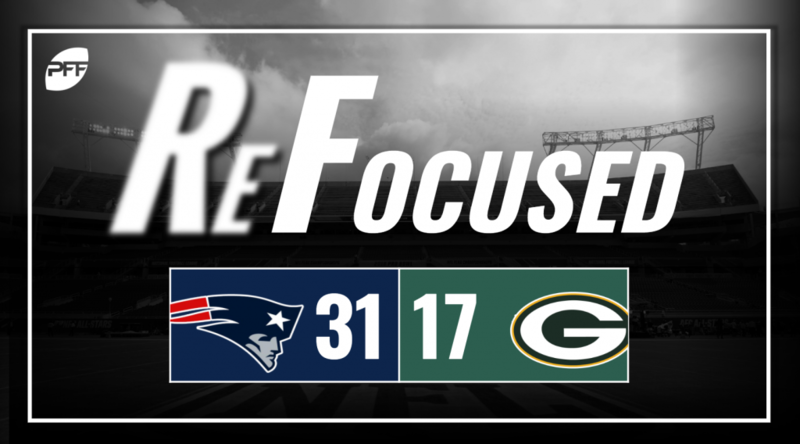 The New England Patriots defeated the Green Bay Packers, 31-17, in Week 9 of the 2018 NFL season. Tom Brady did enough to help the Patriots win, but he didn’t light up the stat sheet and did not look anywhere near his best. Brady missed quite a few shorter throws that you’d expect him to make. The only touchdown pass by Brady was to a wide-open Josh Gordon, who forced a missed tackle and took it to the house. Cordarrelle Patterson, at this point in his career, was deemed to be written off as an important offensive player. However, the Patriots were forced to use him as a running back and found a use for him on offense. Patterson averaged 6.2 yards per carry on the day, flashing great strength and elusiveness on the ground. The New England secondary stepped up in a big way, as they were able to contest multiple passes. Jason McCourty and Stephon Gilmore each had a pass breakup and held the combination of Davante Adams and Randall Cobb under 70 combined yards on 11 receptions. The Patriots’ defensive front had a solid performance, generating a number of hits on Aaron Rodgers and often forcing him from the pocket. Trey Flowers and Adrian Clayborn combined for their lone sack of the game, coming by way of a beautifully executed stunt in the fourth quarter. The Packers’ defensive backfield had up-and-down against the Patriots. Bashaud Breeland struggled in coverage against the Patriots receivers. Second-round rookie Josh Jackson. on the other hand, showed a lot of promise as the slot corner. Jackson broke up two passes and made two tackles in the passing game. The Packers may have had two sacks on Sunday night, but the pass-rush was lacking against Brady for the rest of the game. Part of that was due to the quick passing game of Brady limiting the pass-rush, but when Brady did hold the ball, it often felt like he a significant amount of time in the pocket to make plays. The game was tied at 17 going into the fourth quarter when running back Aaron Jones fumbled, squandering the ball and any positive momentum they had for the rest of the game. Jones was playing well up to that point, averaging over five yards per carry. It was a versatile offensive attack from the Packers until late in the fourth quarter when they had to abandon the run game. Rodgers made some big throws, most of which came his usual way by scrambling around the pocket. He ended with 259 yards passing on 24 completions and two touchdown passes but was careless while scrambling from the pocket at times and fumbled twice. He connected with rookie Marquez Valdes-Scantling on two big plays late in the fourth quarter, giving him 1receivinging yards on the night. The turning point was clearly the Jones fumble on the first play of the fourth quarter. Following that, the Packers’ offense went three-and-out on their next possession, which virtually sealed their fate. The Patriots separated themselves from the Packers in the second half thanks to some unqiue play calling. Julian Edelman‘s pass to James White on a screen play took the ball to the two-yard line. And then the touchdown that broke the camel’s back was a fake screen that Brady threw downfield to a wide-open Gordon, who broke a tackle and put the Patriots out of reach.